Please refer to our stock # W-JO3 when inquiring. 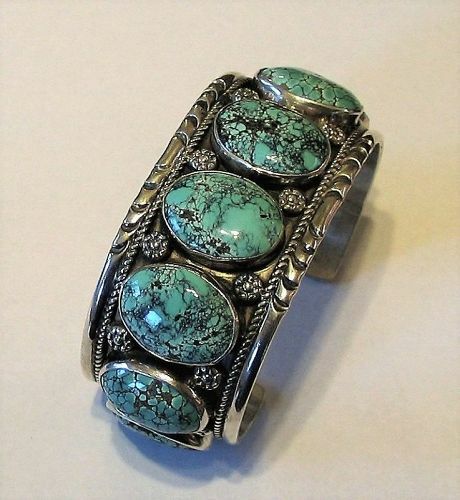 DESCRIPTION: An impressive Native American, hand-crafted, sterling silver cuff bracelet with a wide band set with eight large turquoise stones, each having brown to black veining. Each stone is framed by four silver flower beads, all within a silver twisted wire border. Excellent condition, no chips to stones, very comfortable and beautiful on the wrist. DIMENSIONS: Inner circumference is 6.75" including wrist opening (adult medium size); 8 stones, each 3/4” x 5/8”; band is 1.25” wide; weight is 77 GR.